Social movement studies are now an established sociological specialism far removed from their previous marginal status. This is of course one consequence of the renewed significance of social movement activity in society itself. As social movements have drawn attention to the natural environment, animal rights, civil rights, gender inequality, sexual norms and more, sociologists have become interested in both the 'how' and 'why' of social movements, questions that lie at the heart of this edited collection. Why do movements emerge when they do? Who joins them and why? How are movements organised and what do they do? How do we assess their successes and why do some movements go into abeyance or decline? The excerpts in Goodwin and Jasper's Social Movements Reader address these questions in turn, allowing us to trace the 'life course' of their selected movements. This is quite an unusual structure, but is actually a very effective way of enabling students to see the social process of movements and their relationship to the wider society rather than presenting them as relatively static, thing-like entities. The book also concentrates on empirical case studies, which is a welcome addition to, some might say a relief from, the broad-brush approach of much contemporary social theory. Key concepts are helpfully defined throughout the text and there is a brief 'Biographies' section covering some significant (American) individuals. The latter would have been more effective alongside the case studies though, rather than leaving it until the end, which gives the impression of an afterthought. Still, students should find all of this additional assistance beneficial. So far, so good. Blackwell's Readers in Sociology series aims to provide, 'comprehensive collections of classic and contemporary readings' and this is where questions arise. To name just a few, there is nothing here from Smelser, Turner and Killian, Tilly, Piven and Cloward, Touraine, Melucci, Tarrow, Habermas, Offe or Eder. Clearly this is not a comprehensive collection of readings providing an overview of the developing field of social movement studies. As the editors readily acknowledge, the collection is instead limited, in the main, to a few social movements - civil rights, environmental, feminist and gay and lesbian movements - and is overwhelmingly concerned with such movements in the context of American society. The rationale is to bring social movement concepts, which were developed to address specific questions about the life course of social movements, to bear on our understanding of different types of movement in the same social context. This works well, but it has produced a different type of Reader than that claimed for this series. Similarly, the gains to be had from such a limited selection do have to be set against certain losses. Concentrating on America underplays the transnational or increasingly global context within which social movements operate and does not really explore the learning process that goes on across national boundaries between movement activists and supporters. 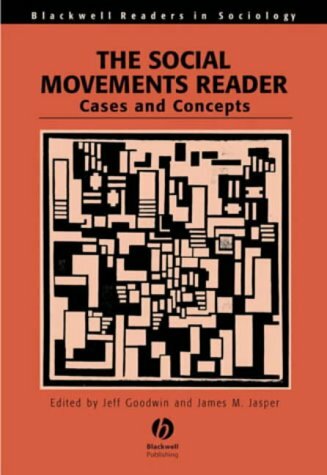 In addition, it is as well to be aware that almost all of the excerpts deal with post-1960s social movements, so readers should not expect to find movement histories or the development of social movements despite a few 'boxed' movement chronologies. One problem here is that the post-1960s 'new social movements' (NSM) paradigm emerged in a European context, so the relative lack of European social movement research ultimately gives the book's contemporary focus an incomplete feel. We don't have to agree with the NSM thesis to realise that bypassing the debates it generated makes the collection less comprehensive than it might have been. Nonetheless, if we accept the self-imposed limitations of the book, then this is a well constructed collection which achieves what Goodwin and Jasper set out to do and is a worthwhile contribution to the literature on social movements. It will deservedly find its way onto the reading lists of many social movement courses, illustrating what American social movement research has to offer as well as providing a series of useful introductions to contemporary movements in the USA.